BOTTOM LINE: A glorified rave with bits of theatrical moments and good but underdeveloped ideas. 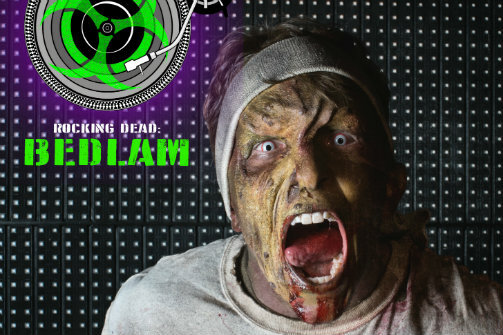 Sold as a choose-your-own-adventure sort of show and utilizing a mixture of narrative, theatrical performances, live music and zombies, Rocking Dead: Bedlam delivers an interactive collective experience with a journey that unfolds in real-time. Because each audience member is not only free to interact but, depending on the ticket price paid, is also assigned a personal story and character name at the beginning of the evening by the actors of the show (already in character and with a story of their own) each night presents its unique twists and turns. For better or for worse. An interesting idea backed up by a talented and energetic group of artists, Rocking Dead: Bedlam unfortunately fails to deliver that which according to its publicity is the core of the show: a narrative. Stories are first distributed and characters seem to be of opposing sides—the classic binary scenario between the good ones and the bad ones—that come together one night to dance the barriers and conflicts away. With access to drugs (colored sugar lumps) and pills (more candy), live music and short moments of staged combat, choreography and a scene or two that mov the plot along, Rocking Dead: Bedlam takes its sweet time to make it all happen. The audience members, now part of a community divided between the infected and the "clean" ones, aren't encouraged enough to engage as active characters within their given story, and an atmosphere of uncertainty begins to develop. Many opportunities appeared to discuss meaty issues that could have improved the night's dramatic tension (such as the choice of the labels "clean" and "dirty," the exploitation of other people's disease and misfortune for profit, etc. ), but the environment seemed to have worked against it. Staged fights in a cage appeared to represent the high point of the moral conflict involving the power hierarchy between the clean and the infected ones, but it derailed towards the cliché arguments and usage of generic words such as "beasts" and "monsters." Another problematic aspect was the apparent lack of a determined running time. The show seemed to go on and on and the longer the night took, the harder it seemed for the company to keep the crowd motivated. The execution of the interactive idea could benefit from a tighter script and story and from an attention to details. With a cast of talented performers, some made their presence known while some remained relegated to a corner, growling at the audience and thus creating an unbalanced array of characters that served more as attractions or archetypes than pieces of the evening's puzzle. All in all, Rocking Dead: Bedlam is an interesting idea that managed to offer fun moments though wasn't entirely successful. Written and directed by aLyssa Kim, Rocking Dead: Bedlam featured special guest performances by Janet Krupin and Gracie Terzian. Designers included Anthony Reyes, Mitchell McCoy, Jamie Roderick, Alex Caraballo, Christine Kahler and Frank Oliva. Producers were Zach Zamchick, April Clark, Saha Helmy and Katherine Paige. Gerome Samonte was the stage manager and Jessica Wasserlauf was the production manager. The cast included Emilia Aghamirzai, Lily Blackburn, Erin Timony Bump, Benjamin John Burbidge, Trevor Buteau, Jaime Fallon, Ethan Itzkow, Jenn Kent, Inês Lucas, Sam Ogilvie, Nicole Orabona, Kevin Percival, Laurel Percival, Lauren Ullrich and Zoë Watkins.